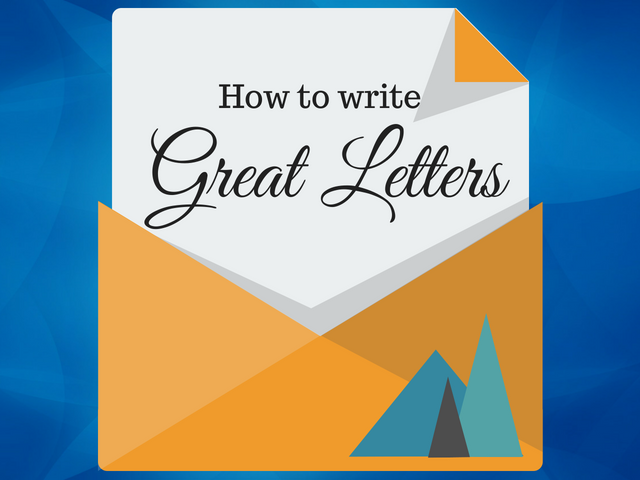 Learn how to write a great letter. Planning tools, video tutorials, writing prompts and teaching ideas for English teachers, students and parents. In this age of digital communication, writing letters is becoming something of a lost art. Emails and text messages can be sent instantly and for a fraction of the cost that good old fashioned snail mail can offer. So, why bother teaching letter-writing at all? Well, though electronic ‘letters’ are often freer in terms of formatting and language than physical letters, we can also apply the rules of letter-writing to electronic media too. However, physical letters do offer some distinct benefits of their own too. A WELL WRITTEN LETTER can change the world. Written in 1939 the EINSTEIN SZILARD LETTER WOULD CHANGE THE COURSE OF HISTORY. Whilst we pride ourselves here on how to write a great essay, information report or other text type that is primarily used in an educational setting, the ability to craft a powerful letter or email has literally changed people's lives, altered the course of history and been the difference between life and death in some cases. It can be the one opportunity we have to remove all the noise and confusion on any subject area and truly tell someone how you feel straight from the heart. Pen to paper. For whatever reason a thousand, emails, tweets, likes will never have the same impact as a well crafted hand written letter. Its very creation and existence shows your reader how passionate and genuine about what it contains. Those of us who grew up in an age before the internet really got going will well remember the excitement of waiting for and receiving a letter. Many of us will have had childhood pen pals we never met, or received love letters from our teenage sweethearts. Maybe some of those treasured letters are still securely stored in a bedside drawer. There is something extremely personal and intimate about the letter that email is incapable of capturing. Letters are a physical thing and their increasing rarity make them seem even more intimate today. Receiving a personally written letter in this day and age is something a unicorn in communication terms. Students who know how to produce a well-crafted letter can use it to their advantage. For example, any business hiring manager will undoubtedly be numbed by the constant torrent of emails applications flooding into their Gmail or Hotmail inbox. That mailed resume accompanied by a handwritten letter that waits for them on their desk in the morning is sure to stand out and secure an attentive read. The letter, in its various forms, is guaranteed to stand out and make an impact in an age where the vast majority of communication is digital. Just as letter writing has declined in popularity, so too has the emphasis on well-developed handwriting skills. You can, if you wish, take the opportunity here to have the students work on their handwriting skills. While students may protest that they can accomplish the task much quicker by word-processing, another benefit of handwriting a letter is that the speed becomes almost meditative. This allows students to focus carefully on their grammar and punctuation, without always resorting to the crutch of spell-checkers and grammar correction software. 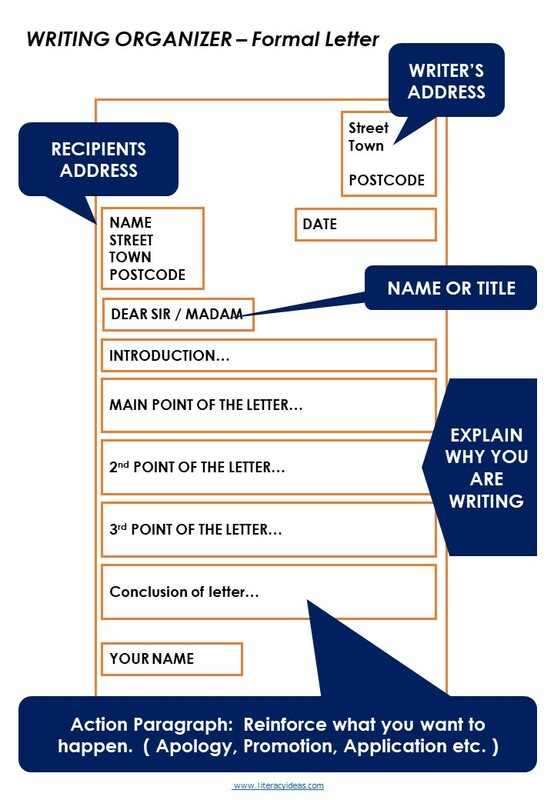 FORMAL AND INFORMAL LETTER WRITING: WHAT'S THE DIFFERENCE? The table below outlines whether you letter should be written in formal or informal manner, with some suggested prompts. Whilst there are many similarities a formal letter should always be considered as a document with a real purpose and ramifications. USED FOR PROFESSIONAL COMMUNICATION THESE DOCUMENTS FOLLOW A PRESCRIBED FORMAT. THEY ARE WRITTEN IN A PASSIVE VOICE FOR A SPECIFIC PURPOSE AND IN MANY CASES ARE LEGALLY BINDING. Make someone feel special about an upcoming event. Write a professional letter of application for a job or group you wish to join. Vouch for another's skills, personality or credibility. Approve or deny an applicant in a professional manner. Make a formal and binding offer in writing. Formally leave or step down in a professional and dignified manner. USED FOR PERSONAL COMMUNICATION THESE LETTERS HAVE NO PRESCRIBED FORMAT AND ARE WRITTEN IN AN ACTIVE VOICE. Let someone know you appreciate their efforts. Acknowledge someone's achievements in life. Acknowledge someones personal loss or suffering and let them know you care. Tell someone how special they are to you and why? LETTER TO THE EDITOR / MAYOR ETC. Let someone know how their actions and adversely affect you and others. Give your older or younger self some words of advice and wisdom. Write a letter back home telling them what you have been up to. Formal letters can be written for a wide range of purposes and may come in a variety of shapes including a letter of complaint, a cover letter accompanying a job application, a letter of invitation, a reference letter, or a proposal letter - to name a few. Though each will adhere to their own rules of formatting and tone, when writing any formal letter students should avoid using slang or contractions. Language should be straightforward and polite. 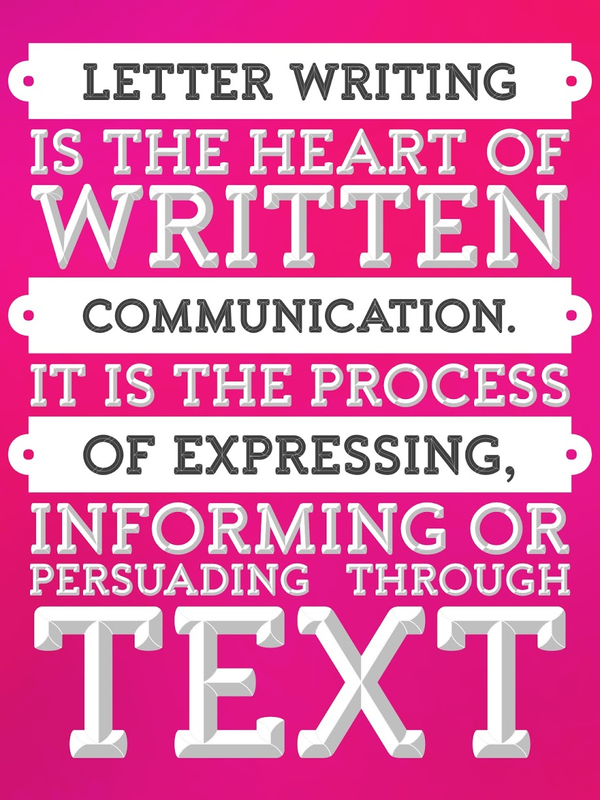 Encourage students to avoid bursts of purple prose in favor of direct, functional language. Usually a formal letter will be written to achieve a particular end and should be written with that end foremost in mind. Students should avoid meanderings and stay firmly focused on the task at hand. If the student knows the intended recipient’s name, start with Dear Mr. / Mrs Surname and end with Yours Sincerely. If they don’t know the recipient’s name, start with Dear Sir / Madam and end with Yours Faithfully. Direct Address: Using the pronoun ‘you’ in a formal letter makes the reader feel that you are speaking directly to them. This helps to engage the reader and encourage them to continue reading the letter. Emotive Language: Where students are trying to convince the reader to take a course of action, the use of emotive language can often be a powerful tool. Students can use either positive or negative colored words to create the desired response in the reader. Facts and Figures: Another way to persuade and convince is to employ facts and figures to support the points made in the letter. There are far fewer rules to follow when writing an informal letter, but there are still some useful guidelines to follow that will prove helpful for students engaged in writing informally. As with any piece of writing, it is important to consider who the audience is and the reason for writing in the first place. In particular, this will help decide the tone and the language register. The more intimate the relationship the more informal the language can be. Though the letter will be informal, it will still have a purpose. Information should still be organized into paragraphs as would be done with a formal, more ‘official’ letter. Students sometimes struggle with this aspect, as they often conflate ‘informal’ with ‘disorganized.’ Making they plan their informal letter prior to writing can help ensure it is sufficiently organized. 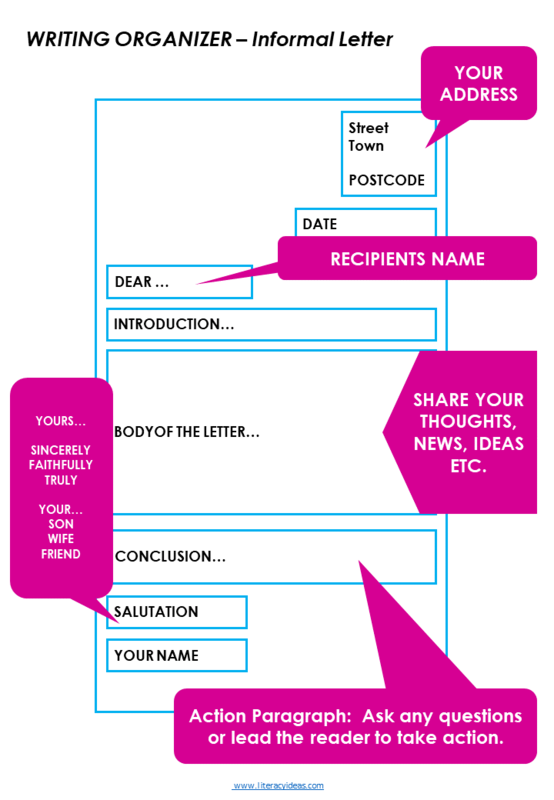 Informal letters will start with a greeting appropriate to how close the relationship is. For acquaintances this may be ‘Dear Tom,’ (using the first name instead of the surname) to a very informal ‘Hi Jane,’. Don’t forget the comma after name! After the greeting, a general opening sentence should follow. Usually this will be something along the lines of a ‘How are you?’ or a ‘How have you been?’. If the recipient is married or has kids, you may wish to ask how their spouse or children are. Next, students should state the reason for writing. The language should be open and friendly in tone and, in contrast to the formal letter, colloquial language, idiomatic expressions, and contractions are perfectly okay and even desirable. Just as the opening salutation to an informal letter is much more relaxed, so too will the closing salutation. There are a multitude of possibilities for the students to choose here and their decision will depend on who they are writing to and their own personal preferences. Some examples of possible closings include, ‘Love’, ‘Best regards’, ‘All the best’, and ‘Thanks’. i. Note addresses, names etc - who are you writing? ii. Record purpose of the letter - what do you want to say? iii. List points to be made (each will form a paragraph) - how will you say it? iv. State action point - what do you want the reader to do? HOW TO MAKE YOUR HANDWRITTEN LETTERS LOOK OLD AND AUTHENTIC. screw them up tightly and carefully unfold and flatten. Lightly dab coffee stains over the paper to make it look aged. Carefully singe or burn the edges of your paper. Have students write as if they were a character from a piece of fiction you have been reading in class. Choosing a dramatic point in the plot, ask students to imagine they are one of the characters writing a letter to another character in the story. This writer may be either formal or informal depending on the scenario presented. This will give students realistic letter-writing practice while also getting them to engage closely with the text and responding imaginatively to its themes. Either offer a range of possible life predicaments or cut out the questions from the ‘agony aunt’ page of a local newspaper. Students must write back offering advice in response to the predicaments expressed in the question or predicament. The response should be written in full letter format. This activity also lends itself to a number of variations. The response may be written to a close friend, for example, or written from the perspective of a professional agony aunt employing a more formal tone and presentation. Have students think of their favorite candy bar or clothing item. Encourage them to imagine they have bought this product lately and found it to be substandard. Students must write a formal letter of complaint to the manufacturer outlining their complaint and recommending a course of action to satisfactorily resolve that complaint. They must use all the features of a formal letter as outlined above. As students become more confident in their understanding of letter writing formats, encourage them to exchange letters with each other for peer assessment. You may wish to provide them with a checklist of features to look for while reading over their partner’s work. Letter-writing can also be a great way to partner up with schools overseas, often children studying English as a second language will be delighted to receive letters from (and write to) students in English-speaking countries. And though email increasingly encroaches on the traditional territory of the letter, many of skills garnered in the practice of letter writing are transferable to the modern manifestation. There is ample opportunity here to link letter-writing learning with approaches to writing emails too. Letter-writing can provide a focus for a wide range of learning objectives, while also teaching students valuable practical skills that will serve them well beyond their school years, both in their personal and work lives. And who knows, perhaps in years to come one of the letters your student writes in your class may become a treasured keepsake in someone’s bedside drawer. Content for this page has been written by Shane Mac Donnchaidh. A former principal of an international school and university English lecturer with 15 years teaching and administration experience. Editing and support content has been provided by the literacyideas team. Literacy ideas is a place for English teachers, students and parents to learn about writing and reading. It has a large collection of resources and tools designed to meet all age and skill levels. Improve your English teaching skills with us. Free Christmas Teaching Ideas for teachers and students. Free postcard template for teachers and students. How to automate reading diary collection in your classroom. Literacy Ideas is a rookie website. Our goal is to make it the best one stop shop for teachers and students to learn the basics of teaching English. Please tell us what you want to see.